Its a pity the 1860's British army drill book didn't have "take aim" and "fire!" commands. Instead, when ordered to "Present" the soldiers were to lift the rifle from "Ready" (waist high pointing at the enemy) to the shoulder, aim carefully but quickly, fire and return to "Ready" on their own time. It was really too dark and dimly lit for taking pictures at my desk down in the wreck room but the figures are painted and glossed, their bases have a base coat of green which needs to dry for several days before getting dry-brushed (the sawdust soaks up paint like crazy and takes forever to dry properly) and I thought they deserved a quick Sunday morning post at least. 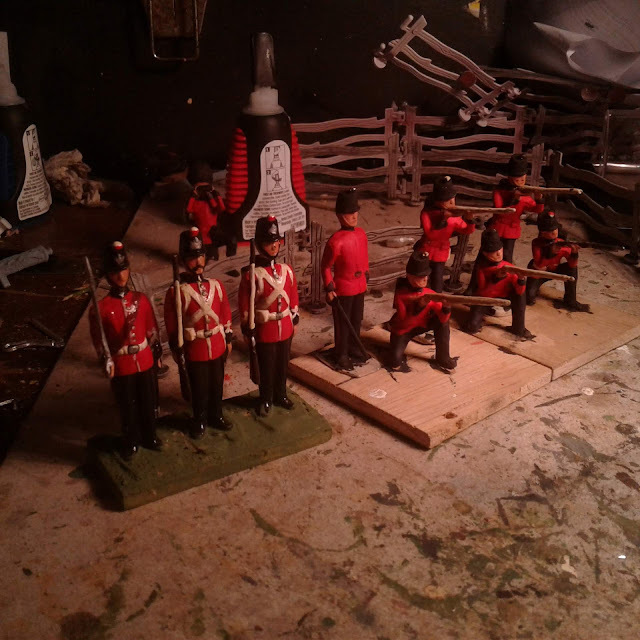 As with the first unit of Fort Henry Guard recasts, I have painted them as 1870-ish Canadian militia rather than Ft Henry Guard (cuffs, shako plate, colour of buttons and the cuff pattern if you were wondering). 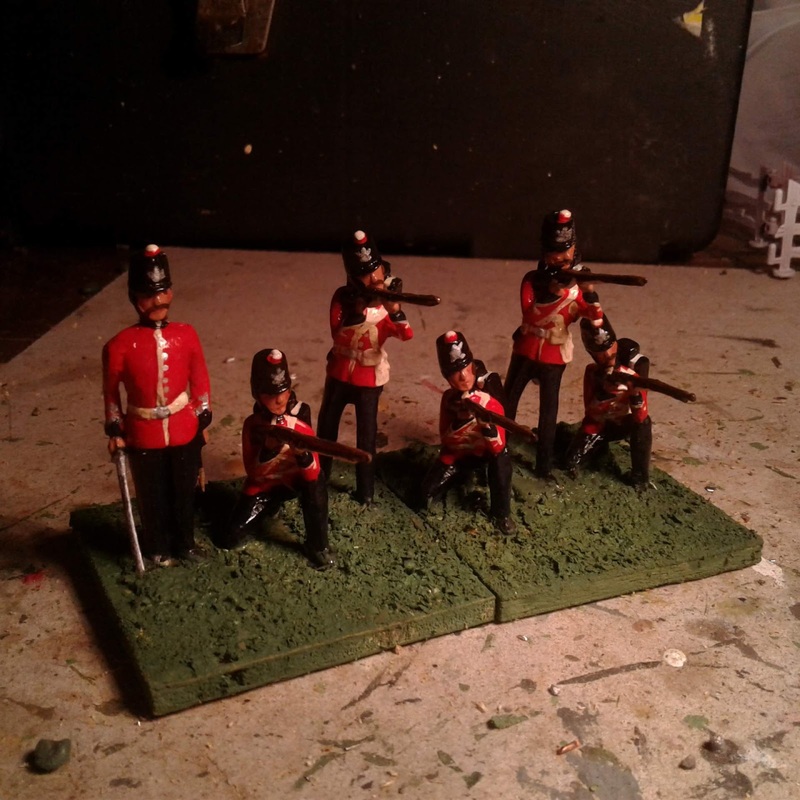 As painted these figures would be just right as my old unit, then the 5th Battalion (Royal Light Infantry) from Montreal but I already have these in their later guise as the Black Watch of Canada. 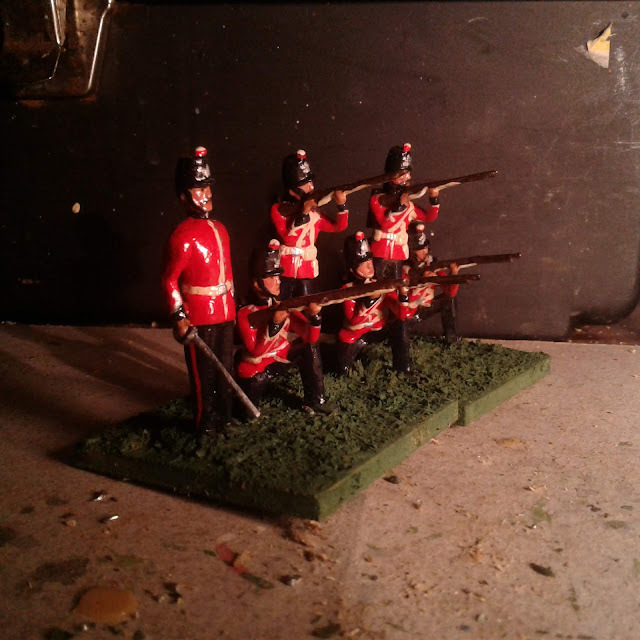 Due to petty prejudices I am reluctant to field more Ontario units if I can avoid it and so these will represent New Brunswick's York County Regiment from around Fredericton where my brother and two additional generations of his offspring live. At least its familiar ground and the first Fenian fiasco was aimed at New Brunswick after all. That settled I can ship them off to Atlantica. I have various non-wargaming commitments over the next two weeks as well as a few nights away visiting and wargaming with old long time friends. Once that is done these lads will see action. Of course, having stripped down the rules so I can fight pitched battles with every unit I can physically cram onto the table, I've remembered that that isn't what I wanted to do with this collection. I have other armies for that. Instead, I want games which encourage a good narrative, like a MacDuff To the Frontier or a Sword & the Flame game but played on the grid if possible or at very least using elements rather than individual figures. I need to reread some of the past Square Brigadier game reports that seem to have produced that sort of game and try to figure "why" and "how". This is a picture from the 1st NorthWest Rebellion game played in April 2014. The one that got me thinking about all this. As predicted, there has not been a lot of time or energy for hobby stuff this week but not a lot is not nothing and I was getting very tired of see a handful of bits and pieces of Ft Henry Guard on my desk waiting for the missing bodies and heads to be cast. is beginning to be identifiable. Thank goodness Toy Soldiers are more forgiving than fine models. A few extra coats of thick paint before the details are added can work wonders. The final coats of gloss varnish will do the rest. My gut usually knows when something is right or wrong but my brain can be slow to get from wrong to right. I understood well enough that what worked for a quick game with a handful of units was not working as well for a larger, longer game. My first guess was that maybe I was after something more traditional and something "more". I just wasn't sure exactly what sort of traditional or what "more" meant so during the dribs and drabs of time I've had this week I scoured various old favourite rules and scenario books as well as past versions of my own rules and doodled with various drastic changes, none of which made it to the table. My floor lamp died today so the pictures are even worse than usual. Today it dawned on me that the rules had been slipping back into focusing the Tabletop General's attention on unit details. They were also allowing too many opportunities to micromanage risk and allowing careful management to assure obedience to orders subject only to combat results and carelessness. So, the first main step was to remove the various ways that had crept in to keep units in the game. Now, to be fair, in most of the sorts of small wars engagements in the era that my Toy Soldier games are set in, during most battles, most units survived the day despite heavy losses. Battles like Little Big Horn, Isandlwana, and Maiwand, were exceptions which is what made them so famous as catastrophes. However, removing units is much more dramatic and fun and simpler in a game than any of the alternative ways of tracking an army's capability to keep fighting. Somewhere around turn 10 of 15. 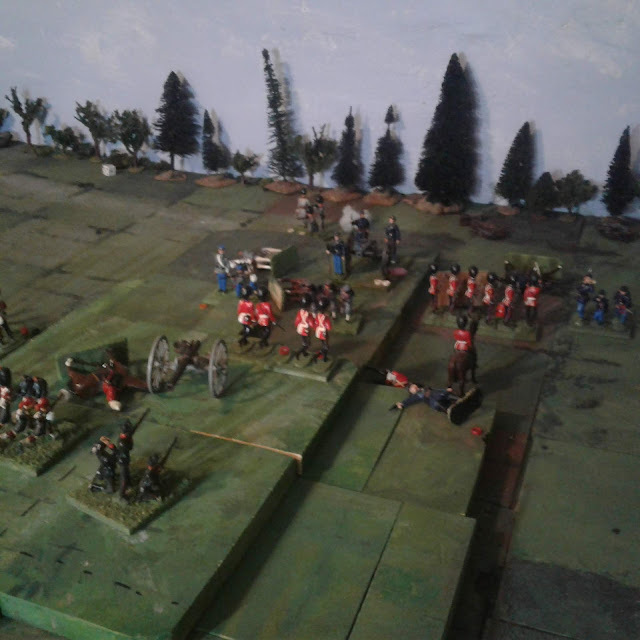 A flanking counterattack by Rebel cavalry has shattered the Highlanders and nearly turned the tables but the Queen's gunners had their range. So, for the umpteenth time, I removed the various overt rules designed to reflect the tactical value of close support etc in favour of removing units after a standard number of hits which in turn increases the value of local supports and reserves to react to flanking moves and to plug gaps. Then I reinstated my old Orders Dice system inspired by DBA's pips system. This works by rolling 1d6 to determine how many formed Brigades and detached units may move this turn. Unused orders may be stored to top up the next die roll. I kept the turn tracking and chance card deck but only for those two tasks. I also once again replaced any rally rules with upping the number of hits each unit can take and allowing 2 battered units to merge at the cost of taking a step closer to army morale collapse. The combat and other rules remain very close to what I have been using for the last few years. Calling the resulting rules "The Square Brigadier" didn't feel right since the player is obviously intended to normally be a Divisional Commander or equivalent and I want to still have a small, quick game for the war of 1812 so I'll leave that be. 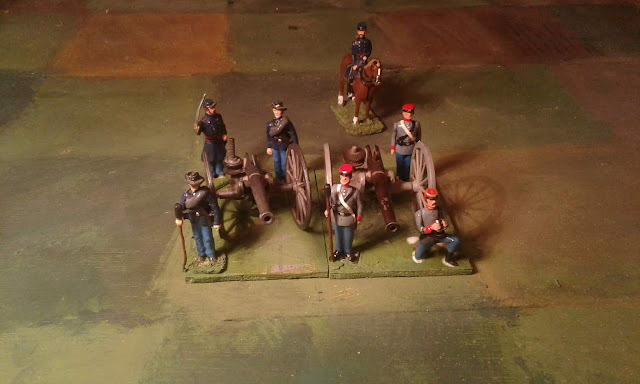 There is proof reading and expanding of explanations to be done but I am happy to finally have a set of rules to carry the name: The Model Major General which I've been wanting to use. A trial, medium sized, game was needed, it was a rainy day and the table was still set up so I reset, swapping sides. The result was a squeaker of a two hour game with a dramatic finish with my attention focused on overall tactics. Turn 15, the setting sun casts long shadows as the Rebel's finally break. 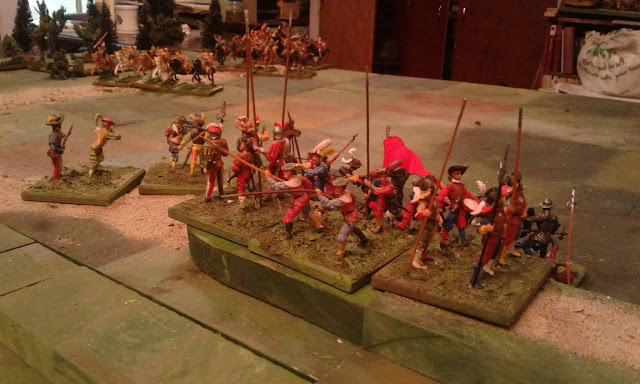 It looks like a busy couple of weeks ahead with some away games in view but hopefully I can get some more toy soldiers painted up before I get sidetracked into the 16thC again. First you get bigger THEN you get faster. 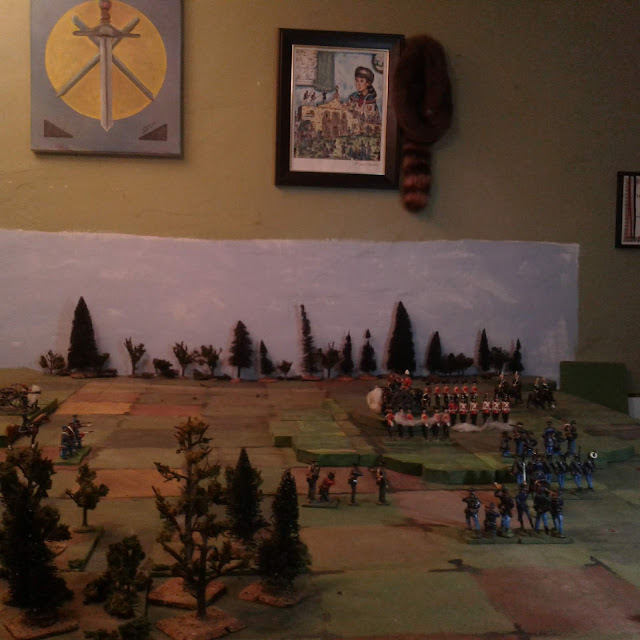 So, I set up a quick game, the OHW of CS Grant's Flank Attack from Scenarios for Wargames. It took about 1/2 an hour to play and was OK for a quick diversion but not terribly satisfying. Quick and Easy. VERY quick. I decided to leave the table up and on the weekend I doubled the forces and had a slightly longer, even less interesting game which I almost abandoned. 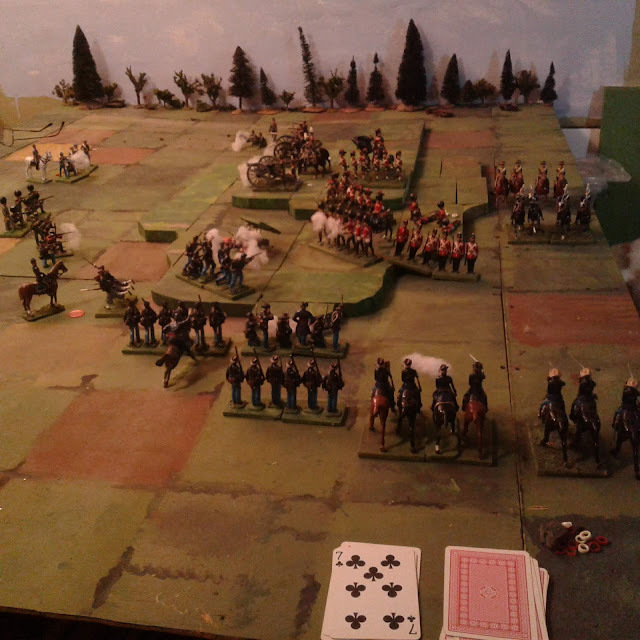 Game 2, Same scenario, twice the units, and a long firefight with little thought or excitement. My instinct was to beef the rules up and add even more detail, complexity and "historical reality" to my fictional toy soldier wargames. Umhh.... that's not where this was supposed to be going. Game 3. Fast and furious. One of the things that finally occurred to me is that a number of the current rules were designed primarily to prolong the game while others were added to try to make various tactical practices overt rather than assumed to be happening without being shown which was the original idea. Others were inspired by various other published rules and I can only guess at why they were originally designed the way they were and question why I think them them a good idea in my own context. 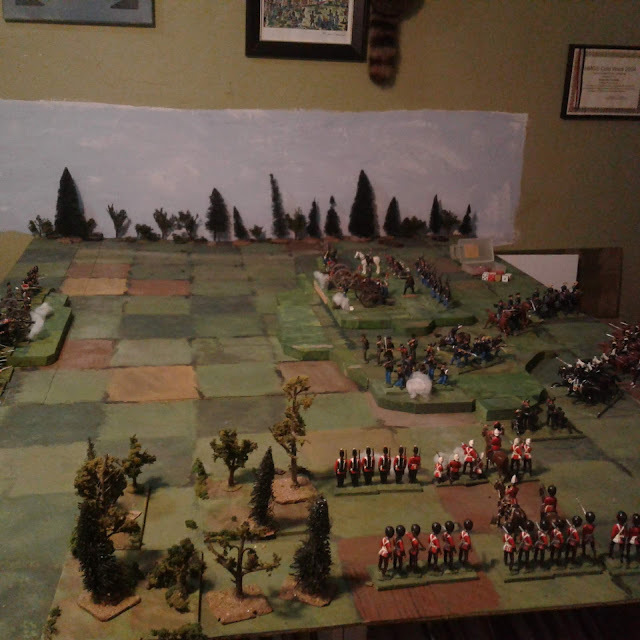 The result was going back 2 years to the drastic War of 1812 rewrite that I was quite happy with and start again. Then they needed testing of course. Game 3: Same moment from a different angle. I meant to play the game in a few days time but somehow I'm already 1/3rd of the way through and was late for evening chores. Luckily, the soldiers are patient even if I'm not. The game will continue. I wanted to play a BIG battle, but I won't have time for a few days and anyway I need to convert and paint a few more units first. 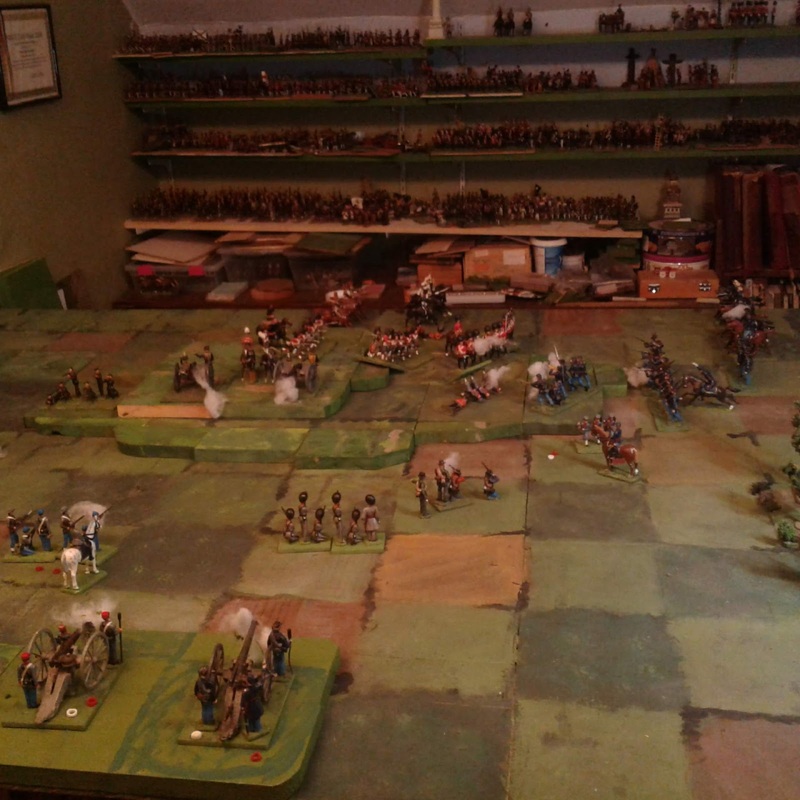 Instead, I've set up the OHW Flank Attack Scenario with 6 units aside. Not sure I will able to make this one last an hour but we'll see. For the last 2 days my hobby time has been spent tearing my jury rigged table apart, adjusting the framework, nailing it all securely together, (There are somewhere around 8 fragments of my 2009 table joined together in jigsaw fashion) and then rearranging things so it will sit on a sturdy base which is equally supported at the same height on all sides. (Which apparently requires moving every !#@#$@$#@ book and bookshelf I own). Normal service should resume by the end of the weekend. 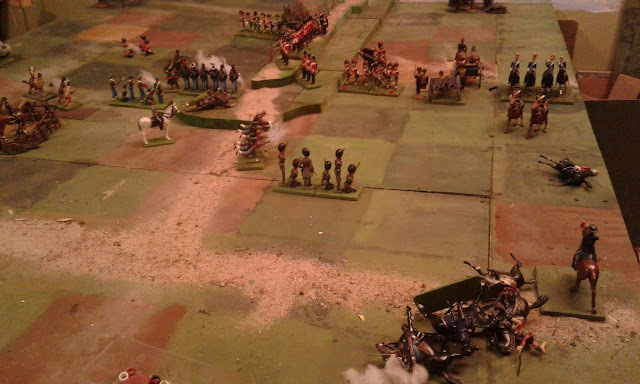 In the meantime, here is a rather vague picture of a test game using Huns and other riffraff to stand in as Turks as preparations for Huzzah 2019 gain momentum. Meanwhile, please feel free to browse through the 1,500 or so posts made during the last 8 years. There is a list of labels below...no lower...lower still way waaaay down, (many a bit too vague I admit) to help choose past topics. Here's 200 and some odd battle report posts. 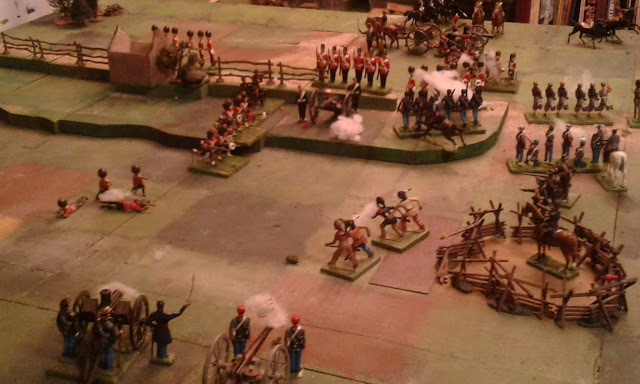 One of the advantages of the non-rigid scale style of Old School wargaming is that you can use a moderate collection of figures to fight everything from a skirmish to a major battle without getting hung up on ground, time and figure scales. However, if designing your own games, this means you are on your own for determining the optimum organization, you can't just pick up an OB and divide by the appropriate figure to man/gun ratio. This is why I found myself reassessing my artillery set up. I've been a bit concerned that my artillery is somewhat less effective than it should be for the 1870's. The question is do I tweak the rules or add more guns. Now, its always tempting to go back to 2 gun batteries as in Charge! and on a 6" grid I could do it even in 54mm, if I REALLY wanted to. 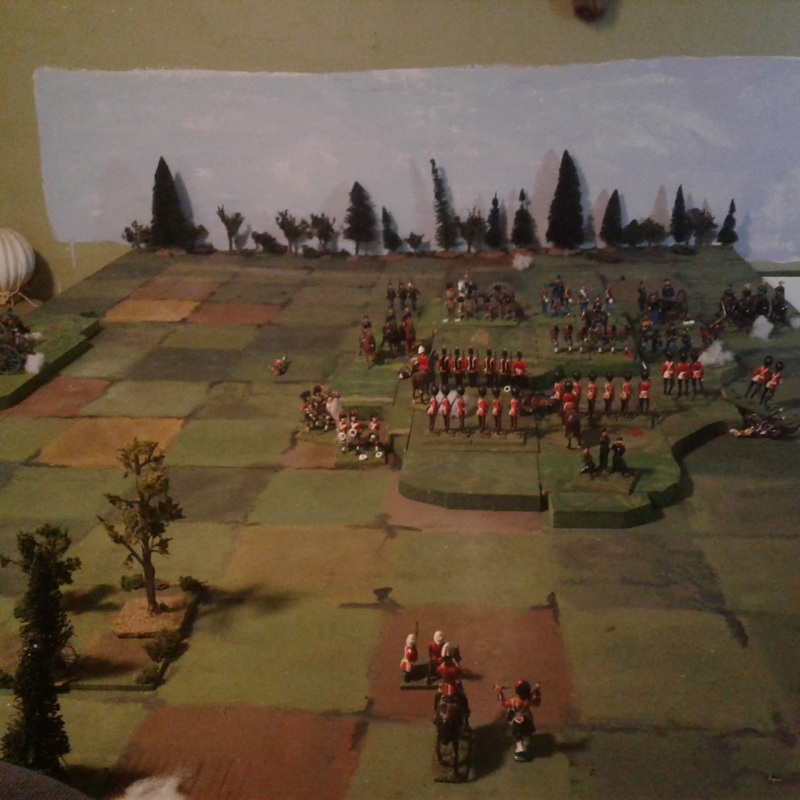 Both Featherstone and Morschauser both used one gun batteries and they have been working for me so I decided to stay with that but to give the batteries a larger presence on the table, hence the return to a 4 man crew as in my Colonial MacDuff days and the move to a bigger base. It didn't look quite right to me and the blog comments only tended to reinforce that opinion so I've been experimenting with other options. The first thought that came to mind was that after the last game I had started thinking about having an Artillery Commander rather than parcelling out the guns and the officer with binoculars seemed to fit the bill. 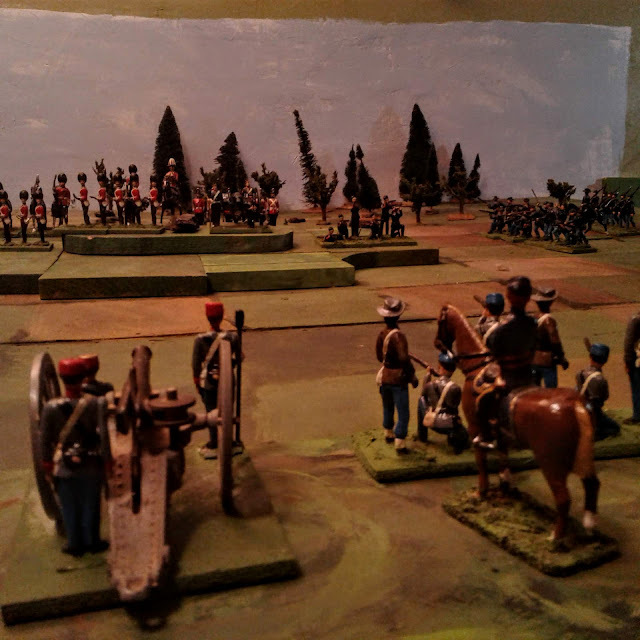 I do like my commanders to be mounted though and now I have the ability to give a mounted artillery officer binoculars (queue 'a mental image of 'Gettysburg' and Porter Alexander receiving his orders). Then I experimented with having batteries composed of 2 guns each with 2 crew. That could work but any terrain of any kind would be an issue and 2 figures did look lonely but 3 gunners and a gun does appears to work. It was going to take time to get the Parrot mould I want and then cast up an extra 4 guns and there is work on the house to be done this fall meaning extra calls on my time and money. In the end I have decided to stick with my 3"x4" bases with 3 crew. This will leave the option of a 2 gun Grand Battery as a dense target but also allow me to increase the number of batteries on the table should I choose to go that route. The number of figures won't match the number of hits the stand can take (unless I adjust that) but that is just a "nice to have", not a necessity. Two batteries formed as a Grand Battery in a single open terrain grid square. 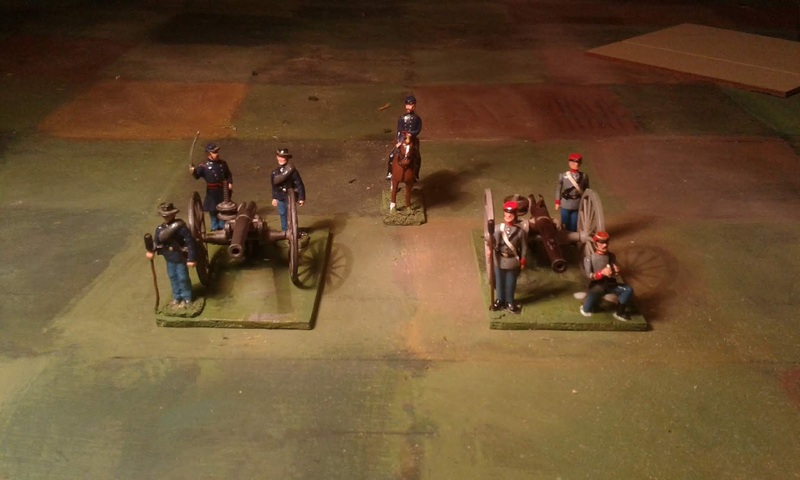 I've decided to bring the Rebel gun crews up to my old standard of an officer and 3 gunners for field guns. 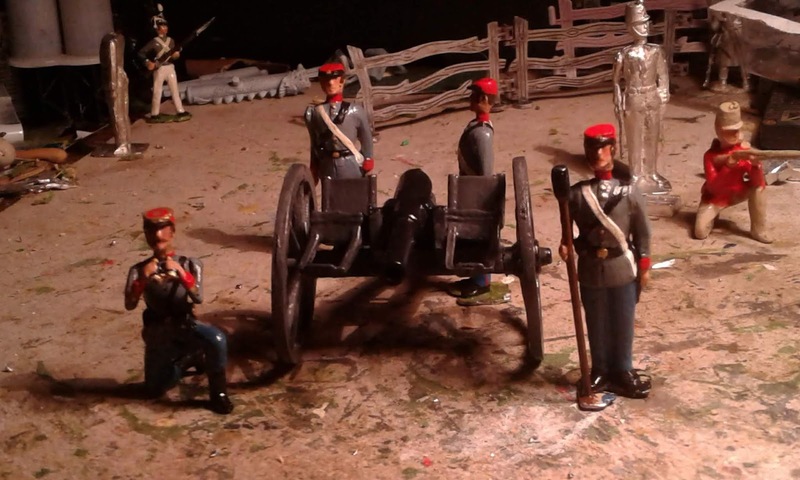 In this case it meant adding a rammer and a kneeling officer with glasses both of which were apparently available in Britain's original Confederate artillery sets. I really need to clean up my desk. Immediately behind are the start of B Company of the Ft Henry Regiment. The reversion to 4 man gun crews has given me a small poser. I used to base the gunners individually but these days I have been mounting 2 gunners on a base. I can fit 4 figures on a reasonable base if three stand behind the gun but both the kneeling officer and the rammer need to be off to the side so either I need a REALLY big base or I'll have to leave the officer separate. Its not an important question but I'm in the mood for consistency. This was the largest battle of my 2nd Age of 54mm wargaming so far and a squeaker of a game with the advantage swinging back and forth but it was also less than half the planned maximum game size. The scenario by the way was a modification of a Thomas One Hour scenario inspired by Lundy's Lane. It would have been a good subject for a narrative write up but I've been focusing what hobby time I have on building up armies and trying to sort out what I'm looking for in terms of rules. The rest will come. 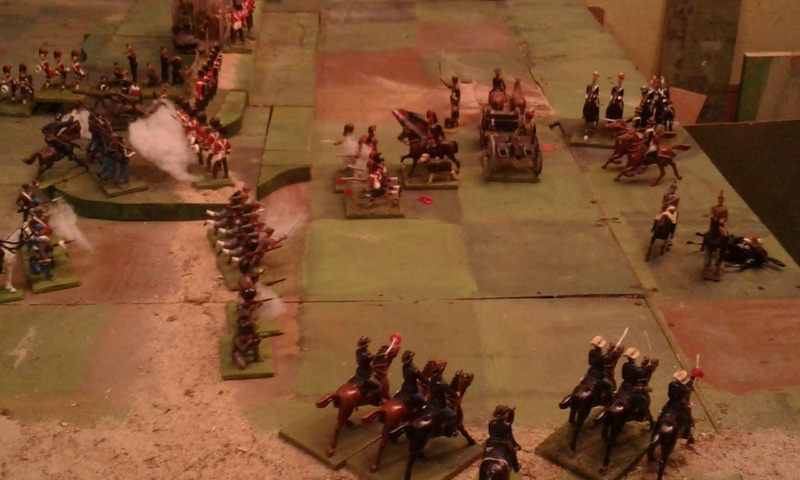 The Queen's Hussars launch a quick charge hoping to stall the Rebel deployment. They slow things briefly but at a high price. I actually started the game with a set of rules using an improvised old school sequence of 1st player moves, 2nd player moves, 2nd player shoots, 1st player shoots, both resolve melee, inspired by one of the sets Don Featherstone used for the little sample game in Battles with Model Soldiers. It actually felt pretty good but it was also quickly clear that there were a LOT of details that required thought, things like firing and moving: should I allow it freely or mark units that moved or something else? I decided to roll back the game to first contact and pull out the familiar Square Brigadier and that is where these pictures begin. A wider view of the same moment. The Rebel's Grey Brigade and sharpshooters have deployed on a wide front and the Blues Brigade has just marched on table followed by the cavalry rearguard. 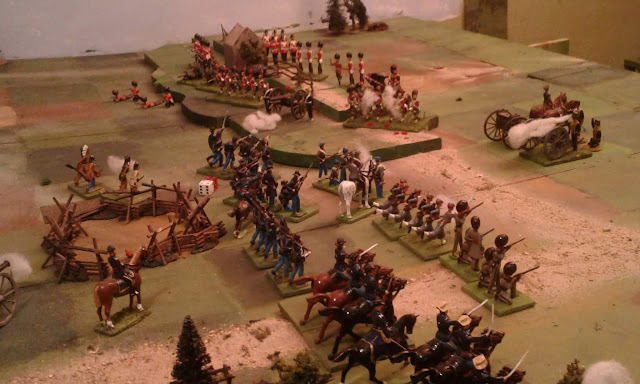 The question for General Lannigan was: "Attack the ridge frontally with as much force as possible or send one brigade to 'amuse' the troops on the hill while the other brigade and cavalry push through the gap to flank it?". Over time, General Lannigan has shown himself to be bold but not one to throw away the lives of his men needlessly. 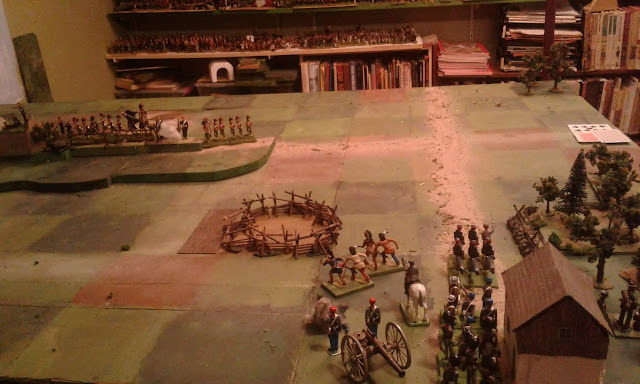 (based on his history of rolled for command decisions) The Blue Brigade has started sidling left to pin the hill supported by the artillery while the Grey Brigade and Cavalry deploy and attack. 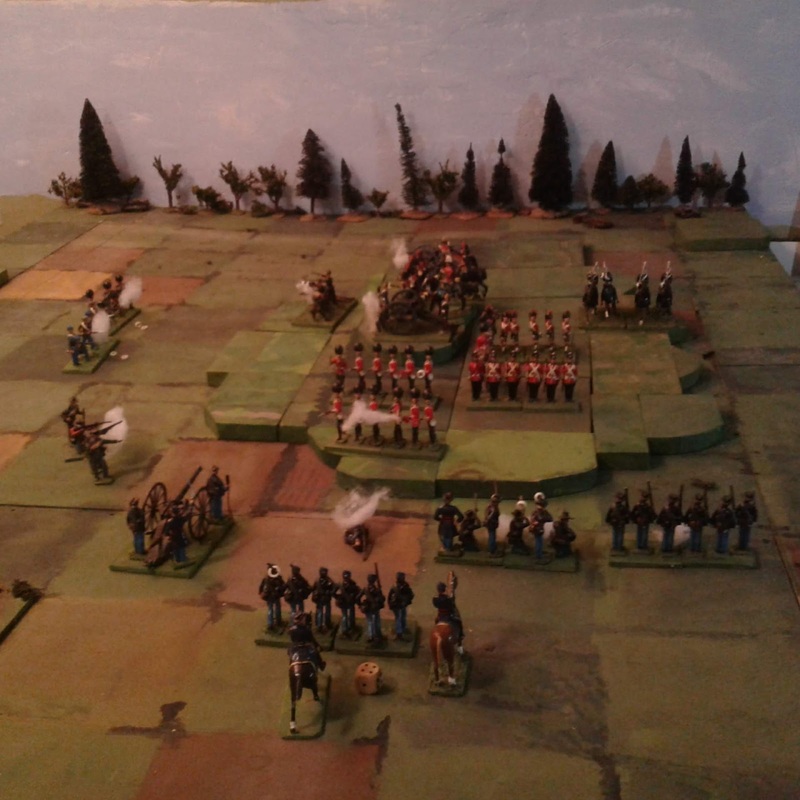 The Guards Brigade, having left their billets at the Double Inn at dawn, have just marched on Rocky's Road and the hill now looks secure against any frontal assault. General Douglas as impatient as ever was not content to calmly wait to be attacked. The Guards and Highlanders were launched into a series of fierce assaults, their flank covered only by the Sharpshooters of the Director-General's Foot Guards. At the same time the Heavy Brigade was launched in a spoiling attack against the Rebel cavalry. 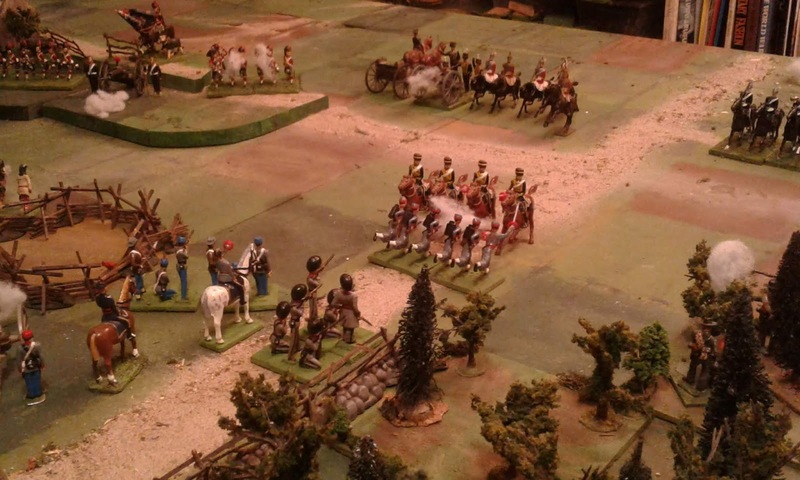 The Queen's cavalry was repulsed with heavy losses and the Grey Brigade pushed boldly into the gap while the Blue Brigade held firm. 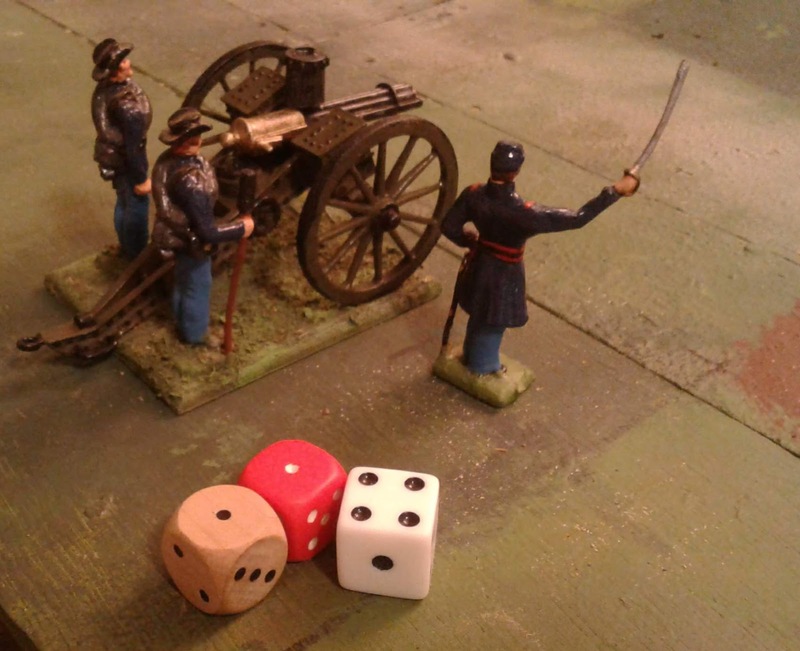 Off screen, the Sharpshooters were being riddled by one of those new fangled Gatling guns (once the crew figured out how to work it) and B Battery was losing the artillery duel. It was looking pretty good for the Rebel cause. The Queen's army had lost several units at this point with others just barely hanging on but a brave charge by the handful of remaining Pensioners utterly wrecked Blue's cavalry and the Guards and Highlanders were still hanging on as the sun started to sink. 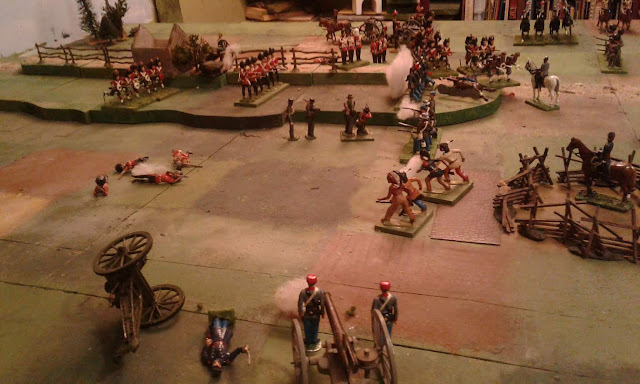 Only one Foot Guards Sharpshooter was left but he seemed to have found good cover and relentlessly picked off the Gatling crew until it fell silent. The Grey Brigade had been hard hit by artillery and rifle fire when suddenly the skirl of Pipes could be heard and with MacDuff and Cu Mor at their head, the remnants of A company of the Royal Highlanders charged the Zouaves who met them bayonet to bayonet! The fighting was fierce between the veteran Highlanders and the young Zouaves fighting in only their second action but in the end, the Zouaves broke. There was only an hour to sunset, the remnants of the Queen's cavalry was now behind the Rebel flank and half of the Rebel units were broken. General Lannigan reluctantly ordered a retreat. General Douglas, whose army was itself teetering on the edge, gave a huge sigh of relief and allowed the enemy to retreat unmolested while he quietly sang under his breath: "One, Two Three, Four, Five, Hunt the hare and turn her down the Rocky Road and all the way to Double Inn.."
More on rules and things another day, there are figures to paint and basing to be done! ps: I couldn't resist and played out the last 3 turns ignoring Army Morale. It didn't change the result, partly because Red's dice got hot and Blue's fell cold. The rebels ordered a gatling gun from Armies in Plastic some time ago so I painted it for today's game. I didn't have time to paint up a new crew for it before the game so I reassigned some gunners. It was probably inevitable that it first shot was a jam. While Her Majesty's troops were resupplying garrisons, clearing their lines of communications and starting to stockpile supplies for a "Final Campaign", the Rebels quietly consolidated their forces and launched a sudden attack. General Douglas was caught off guard and forced to order a hasty concentration. MacDuff's Brigade was stationed forward on the frontier while the Guards were billeted in and around the prestigious Double Inn in Windsor. The Cavalry Brigade was in reserve near Belmont. This portion of the Origawn Territory is mostly flat open prairie with occasional patches of woods and an increasing number of isolated farms. There are not a lot of good defensive positions. A quick look at the map shows that there is a low ridge just East of the Belmont Road. Running along this ridge is a secondary road known as Rocky's Road that runs down to Windsor. The Ridge and road are named after an old trader named Rocky whose cabin is home to the best whiskey in the territory. 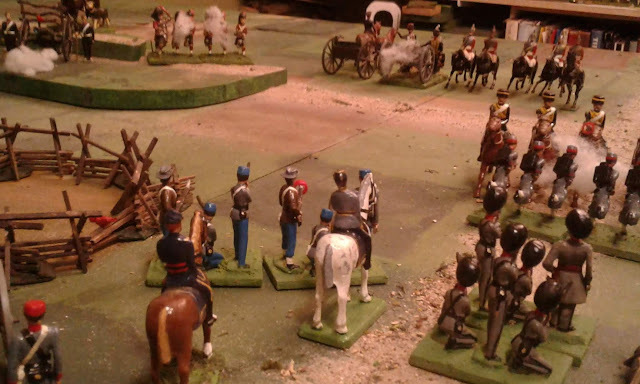 B Battery opens fire as the rebels arrive. It was the most obvious place for the army to concentrate. MacDuff was ordered to fall back to the Ridge and hold at all cost. The cavalry was ordered forward up the Belmont Road while the Guards were ordered to march at best speed up Rocky's Road from the Double Inn.